Suicide is a national tragedy that has a devastating impact on individuals, families and communities, an impact not always obvious or recognised. People from all ages and from all walks of life take their own life and the causes appear to be a complex mix of adverse life events, social and geographical isolation, cultural and family background and supports, socio-economic disadvantage, genetic makeup, mental and physical health, coping skills and resilience. Sub-population groups that are at higher risk of suicide include Indigenous Australians, men, young people, gay, lesbian, bisexual, transgender and intersex communities, those bereaved by suicide and those living with mental health disorders and people living in rural areas. Suicide is the leading cause of death for Australians aged between 15 and 44 . For every person who dies from suicide, it is thought at least another 20 people attempt to take their lives. Suicide is also the leading cause of death for people seriously affected by mental illness. Up to one in 10 people affected by mental illness will die by suicide. 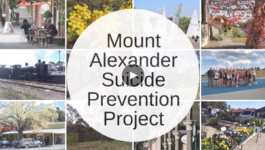 The National Coronial Information System showed high rates of suicide in the Macedon Ranges and Mount Alexander, well above the Australian average. Other available evidence tells us that some communities within the CVPCP have high rates of people with depression, anxiety and mental and behavioural problems in the general population. This project uses a place-based approach to increase awareness of suicide and improve community capacity to look after themselves and others. A report, video and case study are available to share the learnings of this project.